Lock in a great price for Holiday Inn Shanghai Jinxiu – rated 8.2 by recent guests! The staffs were nice and helpful. Good price for the room quality. Thanks for Mr. Jia from front desk upgrading my Standard room to Suite. Perfect facilities and living experience in Jinxiu! - My room was super nice! Spacious, table for working, a sofa for relaxing, huge bed, spacious bathroom, nice city view. - Machine for money exchange. :) - Everyone was helpful. The hotel is good and apparently well renovated. The rooms are clean and spacious with a wi-fi available. The staff at the reception desk is very friendly and always help to call a taxi and advise destination you need to go. There is a fitness center on the 3rd floor with plenty of various exercise machines, sauna in a changing room and even big swimming pool. Not sure if paying for a breakfast is necessary, as beside an ATM which accepts cards issued by foreign banks and flight information screen in the lobby, you may also find free tea & water and 24 hours working store with quick snacks & beverages. Moreover, big number of snack bars & restaurants offering traditional Asian cuisine are located nearby. Internet was fast and the breakfast was good. we stayed because my aunt lived near the hotel and it was pretty good for the price. It's close to a really good bakery. Staff was good. A few staff members spoke English. Pleasant large hotel, helpful staff, lots of choices at the breakfast buffet, rooms are comfortable and very clean! Excellent Breakfast...!!! Many varieties for vegetarians as well. The breakfast was really good, the water pressure in the bath and shower was strong and the bed was really comfortable. The gym was good, they had lots of equipment and weights. The swimming pool is big, split into lanes and clean. There's also a sauna in the changing rooms. It's a 40 minute cab drive from the airport depending on traffic and about a 20/30 minute drive to the bund. We actually walked to a bus stop and took the bus to the train station which was very convenient too. Around the hotel there are a few nice shops and restaurants too. The Will's Gym has excellent equipment and swimming pool. 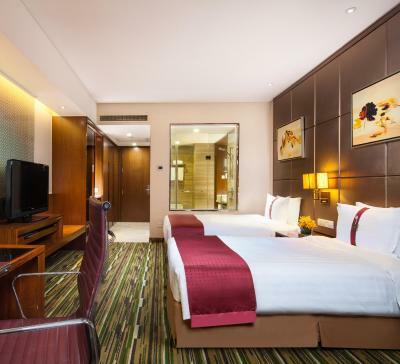 One of our top picks in Shanghai.Holiday Inn Shanghai Jinxiu is located in Pudong District, a 15-minute drive from Shanghai International Exhibition Center. Modern and stylish, it offers an indoor pool and a rooftop restaurant. Free Wifi and free parking are offered. Holiday Inn Jinxiu is a 10-minute high-speed Maglev Train ride from Pudong International Airport. Shanghai Disneyland is 27 minutes' drive from the property. Lujiazui Financial Area is within 25 minutes' drive. Jing'an Temple can be reached in 25 minutes by car. 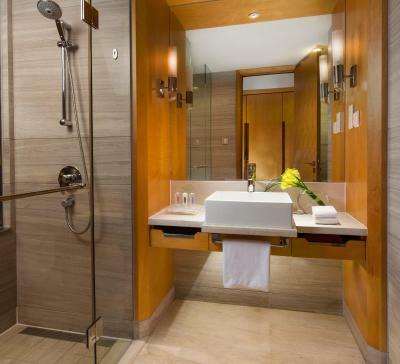 Rooms at Shanghai Jinxiu Holiday Inn feature flat-screen cable/satellite TVs and modern glass bathrooms. Each comes with a mini-bar and personal safe. Many rooms overlook the park. Guests may exercise at the well-equipped fitness center or relax at the steam bath and sauna. For added convenience, the hotel also provides a business center and laundry services. Concierge service is warmly provided. The Oasis offers all-day dinning, while Harvest Festival Chinese Restaurant provides lunch and dinner. 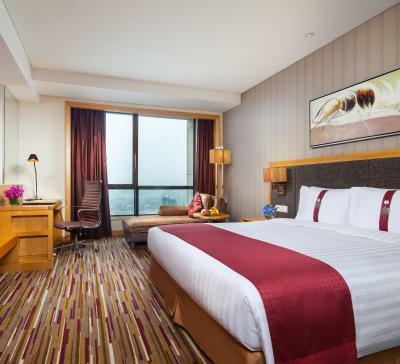 When would you like to stay at Holiday Inn Shanghai Jinxiu? This room has a 37-inch LCD TV, a shower, high speed internet, signature bedding and choice of soft or firm pillows. It is located on the upper floor featuring a view of park. Get work done at the big work desk with ergonomically designed chair. In room safe is offered. This room has a 37-inch LCD TV, a shower, high speed internet, signature bedding and choice of soft or firm pillows. Get work done at the big work desk with ergonomically designed chair. In room safe is offered. This spacious suite features a living room and views. Guest can have access to the Executive Lounge. Room comes with a mini-bar, a 37-inch flat-screen TV, ironing facilities and a private bathroom with a bathtub. Please note that smoking is not allowed in this room type. Located on the floors 23-25, room features panoramic city views. Please note that smoking is not allowed in this room type. Enjoy easy access to Shanghai International Exhibition Centre and fine event facilities at the high-rise Holiday Inn Shanghai Jinxiu. Hotel surroundings – This neighborhood is a great choice for travelers interested in family-friendly trips, Disneyland and aquariums – Check location Good location – show map Guests loved walking around the neighborhood! House Rules Holiday Inn Shanghai Jinxiu takes special requests – add in the next step! One older child or adult is charged CNY 191 per person per night in an extra bed. Greatwall Peony Dragon Pacific Jin Holiday Inn Shanghai Jinxiu accepts these cards and reserves the right to temporarily hold an amount prior to arrival. Holiday Inn Shanghai Jinxiu accepts these cards and reserves the right to temporarily hold an amount prior to arrival. Kindly note that the hotel offers shuttle bus from the hotel to World Expo Exhibition and Convention Center, New International Expo Center and Shanghai Disneyland at additional cost. For details please contact the property directly. Due to limited bus seats, please go to the concierge desk to make a reservation one day in advance before 21:00. Bill was confusing, charged different amounts for the same room on consecutive days of the week. The Reception Manager was brilliantly helpful with my early check in after a long flight. He didn't have to do that for me. No one spoke english, literally. I would expect someone working in the international hotel to speak at least a decent english but nope. They were all very nice though. Hotel is about 10-15 minutes far from the nearest metro station and the area is definitely not the nicest. The room was very clean and nice. Swimming pool and gym also very nice. Not that far from the city center. Apart from all the advantages you may take staying in this hotel, a fly in the ointment may be its remote location. Keep in mind that a taxi is only a transport you may use to get it, and sometimes (considering a busy traffic in Shanghai) 20 minutes by a taxi are not enough to reach other destination. It's a 15 minute walk to the nearest Shanghai Metro station. It is located near a quiet area with nearby shops and restaurants. The gym was amazing and the room service.